Heat deep skillet or wide pot over medium high heat. Add oil and turkey. Crumble meat as it cooks, 3 minutes. Add the onions and garlic, chili powder, and chipotle. Cook another 5 minutes. Season with salt. Add beer and cook another minute, stirring to loosen any bits from the bottom of the pan. Add the stock, tomatoes, and beans and bring to a bubble. Reduce heat and simmer 10 minutes. Heat a nonstick griddle pan over medium high heat. Mix batter and cheese together. Rub grill with butter, nesting the butter in a paper towel to hold on to it. Ladle the batter to make 3-inch cheese and corn cakes. Cook 3 minutes on each side, until golden. Transfer them to a plate and cover with foil to keep warm. 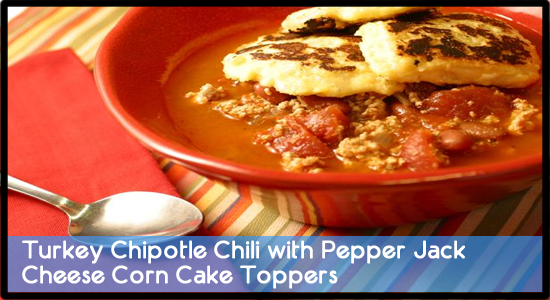 Serve bowls of chili with cheese-corn toppers — like a spicy, corn topped chili pot pie.